Listen to "Killing Patton: The Strange Death of World War II's Most Audacious General" on your iOS and Android device. Listeners around the world have been enthralled by Killing Lincoln, Killing Kennedy, and Killing Jesus-riveting works of nonfiction that journey into the heart of the most famous murders in history. 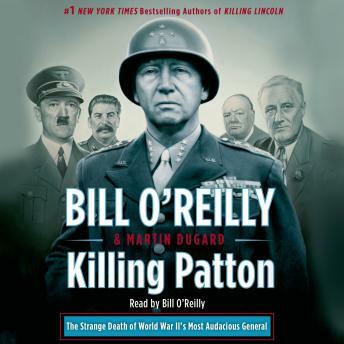 Now from Bill O'Reilly, iconic anchor of The O'Reilly Factor, comes the most epic audiobook of all in this multimillion-selling series: Killing Patton. Excellent!! Like Killing Lincoln, one of the best non-fiction, or any type of book, I've read or listened to. Brings up some points that really make you think. Also gives you insight into why certain decisions were made, even though they appear to be the wrong ones. I never realized before just how much we gave into the Russians and how we didn't support Britain's post-war plans. It illustrates just how much the military is a "What have you done for me lately" organization. I spent over 12 years in the military and it hasn't changed a bit. The way Patton was treated is deplorable. This is a book that everyone should read. Enjoyed the factual nature of this book. It was a very enjoyable listen w/Mr. O'Reilly. Very sad to learn that such a great man, succumbed to a freak accident (or possibly another strange event). I really enjoy historical stories (particularly WWII). It was very interesting to listen/read about the battle in Belgium and how Patton tried so desperately to get his tanks up to Bastogne (sp?) to rescue the 101st. I actually really liked the narration. Finished it on a long ride from Florida to Ohio and he kept me engaged on a historical individual I did not have a strong base of knowledge on. Admittedly, as with most of the 'killing' books, they are more period based than just the title person, with interesting vignettes built in along the way. A little confusing with all the general names, it would probably make a better book read than an audio listen. Mic drop. Out. Topic is interesting, but narration is horrific. This seems to be read without any practice or editing at all. Intonation and cadence is completely off and it is very hard to follow. I found it hard to get through and in retrospect would have much rather just read the text. The book is factual not big on imaginary. It was interesting not sure I would read another book by him. His voice made it almost impossible to follow closely until you got use to it which i really never did. Great book. Really enjoy. The narration was excellent and story well told. Never let this guy read a book again. His voice, intonation, etc. are plain awful. As a result this book sounds more like propaganda than history. After listening to this, I wonder how much is true and how much is hyperbole. For example, the German and Russian soldiers were all just rapists and pillagers while American soldiers were the reincarnation of Christ. When 26 Brits die during a German bombing of London, they are innocent civilian victims, yet when tens of thousands German civilians die during the firebombing of Dresden and other cities, they are just Germans. When Stalin sends the lover of his daughter to a Siberian camp, the disgust in his voice is clear, but when Patton sends a rival lover of the woman he was having an affair with to the front lines, it's just glossed over. As for the Patton story itself, it is interesting, considering the guy was a wack job. Fantastic soldier but clearly pyschiatrically challenged. Being read by Bill O'Reilly is miserable. Its not that I dont like the guy for his view or what not but his voice, speed, and intonation is terrible.